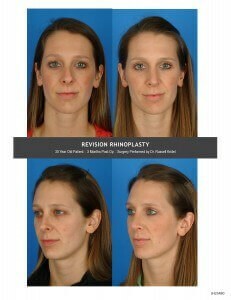 A revision rhinoplasty is more difficult than primary rhinoplasty surgery for many reasons. The most important reason is that the anatomy inside the nose has already been altered during the first nose surgery (primary rhinoplasty). Prior to any nose surgery, there are layers of tissue planes that have natural separations between the types of nasal tissues. As a surgeon operates on your nose for the first time, the surgeon can easily separate these layers to access different structures. This is not the case, however, with revision surgery. These anatomical plane no longer exist. That makes revision surgery harder. It's almost as if someone has put glue in the nose because skin is stuck to cartilage and bone. Some patients that desire a revision rhinoplasty feel like their nose looks "operated on". This may be the result of the nose healing in an irregular manner or too much cartilage was removed during the first surgery. Other difficult rhinoplasty situations are noses previously operated on that are now too small, too short or too pinched. In such cases, drafts have to be added. And, these grafts must be molded to take on the shape and the function of the previously removed tissue. You do not want to leave this type of complicated surgery in the hands of just any surgeon. Needless to say, it is extremely important that you select an experienced, facial plastic surgeon for your redo because nasal revisions are especially difficult. Dr. Kridel has performed thousands of successful revision rhinoplasty surgeries. He has also written over 60 medical journal articles and text book chapters just on nasal surgery. Including a published journal article on the use of irradiated cartilage for rhinoplasty surgery that was hailed by his peers as a landmark study. This is an example of a pre-operative and post-operative photo of a Facial Plastic Surgery Associates revision rhinoplasty patient. The surgery was performed by Russell Kridel, MD. In addition to these other before and after photos, you will also see numerous additional photos in the office at the time of your consultation.